At Abilene Family Dentistry, we want to help you keep your natural teeth healthy and in your mouth. That’s what preventive dentistry is all about, and endodontic care is an extension of the practice that becomes necessary when infection is present—specifically within your tooth, beneath the enamel and dentin. If infection does reach your inner tooth, you’ll know because it can cause an excruciating amount of pain. Our endodontic services, which include pulpotomies, pulpectomies, and root canals, are meant to remove infection, relieve you of pain, and get you back on track to better oral health. Pulpotomies and pulpectomies are also referred to as pulp therapy. The pulp within your teeth contains blood vessels and nerves, so if infection (usually as a result of tooth decay) reaches it, immense pain will ensue. When this happens in a baby tooth, we’ll recommend a pulpotomy or a pulpectomy, which will depend on how deep the infection has gone. Pulpotomies and pulpectomies help prevent tooth loss, which means you won’t have to look at replacement options to keep the surrounding gums, tissues, and bones strong. A pulpotomy consists of removing diseased pulp from the crown, then sterilizing the tooth’s chamber to prevent further infection and calm the nerves. If the infection has reached the tooth’s roots, a pulpectomy will remove the diseased pulp from both the crown and root canals before sterilization. Both procedures are usually completed with the placement of a crown to restore the tooth’s function and strength. Root canals are the adult tooth version of pulpotomies and pulpectomies. While we definitely want to save baby teeth from premature tooth loss, it’s especially important for us to do what we can to save you from losing an adult tooth. We know these procedures don’t sound pleasant, but they actually relieve your teeth from the pain of infection, and by most reports feel no worse than having a cavity filled. 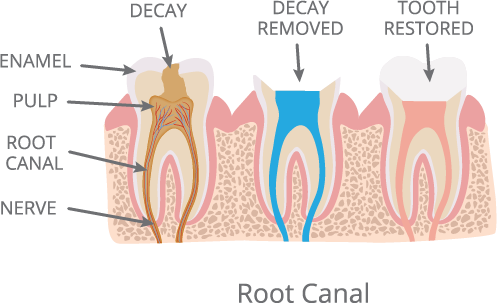 Like pulp therapy, most root canals are completed with the securing of a durable crown. If you have any questions about endodontics or you’re ready to schedule a consultation with your Abilene dentists, Dr. Webb and Dr. Awtrey at Abilene Family Dentistry, give us a call today or request an appointment online. You can count on us to do all we can to save your teeth!